The max file (gwTut6_foresthouse.max) included for this tutorial isn't meant for each step of the tutorial. While you go through each step of the tutorial, you will be able to get ideas and tips on how to use GroundWiz Terrain Map & GroundWiz Planter and then experiment yourself. 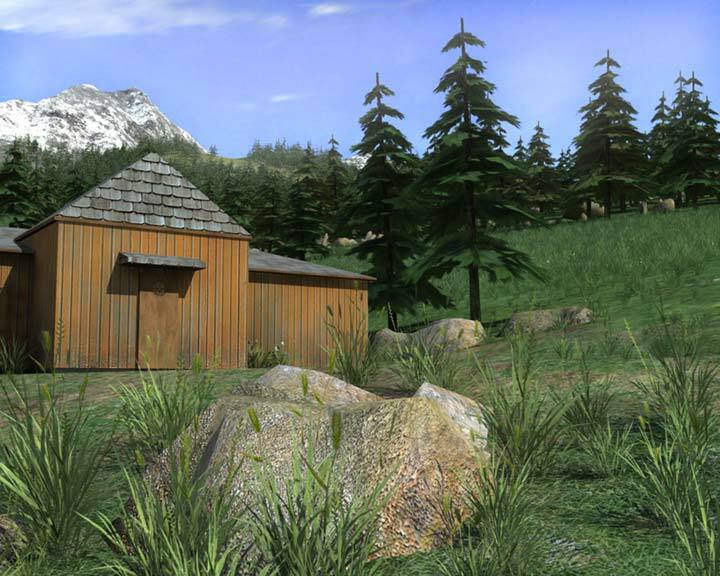 Note that the max scene file (gwTut6_foresthouse_Lite.max) for this tutorial in GroundWiz Lite is simplified to be compatible with GroundWiz Lite. It is not an easy task to make nature scene look random and detailed from both close-up and far view. 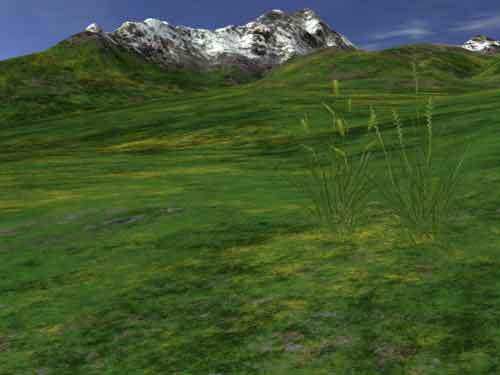 First, GroundWiz Terrain Map will be used to create textures for the mountain in the spring. After the ground is ready, GroundWiz Planter will help you plant a huge number of trees, rocks and grass objects and then modify and fine-tune some specific ones you choose the way you want. For this tutorial, I imported a 3DEM file of real terrain into 3ds Max. If you are interested in how to import real terrain into 3ds Max/VIZ, you may refer to "Tutorial: Importing Yosemite Park into 3ds Max". 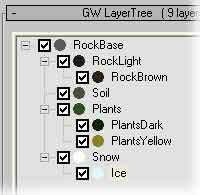 To create a basic look of the terrain texture, first I created 4 layers: RockBase, Soil, Plants and Snow. RockBase: It's a base layer in the layer tree for rocks. Set StrechUp to 10, RGB color to RGB 90/90/90, Bump Strength to 100, Detail to 50, Amount to 100, and Noise to 0. Soil: This layer is for soil. Set StrechUp to 10, RGB color to RGB 90/90/90, Bump Strength to 100, Detail to 50, Amount to 100, and Noise to 0. Plants: It's going to be a green area for grass and plants. Set StrechUp to 10, RGB color to RGB 48/80/32, Bump Parent Influence to 5, Bump Strength to 60, Detail to 52, Amount to 85, Noise to 50, Altitude Limits Max to 290, Altitude Limits Transition Height to 100, Slope Limits Max to 58 and Slope Limits Transition Angle to 15. Snow: This layer is for the peak area of the terrain. Set StrechUp to 10, RGB color to RGB 255/255/255, Bump Parent Influence to 5, Bump Strength to 45, Detail to 70, Amount to 60, Noise to 25, Altitude Limits Max to 270, Altitude Limits Transition Height to 100, Slope Limits Max to 65 and Slope Limits Transition Angle to 10. Tip: Since rocks are usually rough and bumpy, big bump strength and parent influence are recommended. Rock detail depends on what kind of rock surface you want to create. Generally, the bigger detail is, the more sandy and finer it is. I usually use detail for rocks up and down around 50%. On the other hand, for plants and snow layers, small parent influence and bump strength are used. Particularly, snowy area is likely to look soft and smooth. However, you can still adjust these parameters to achieve the best result you want the way you desire. After the basic layers were set, I added children layers to the basic ones to get more varied look. As seen in the above image, Rock, Plants and Snow layers were given children layers that added nice variation especially to color. To see how layers were set up, please open the tutorial max scene file. 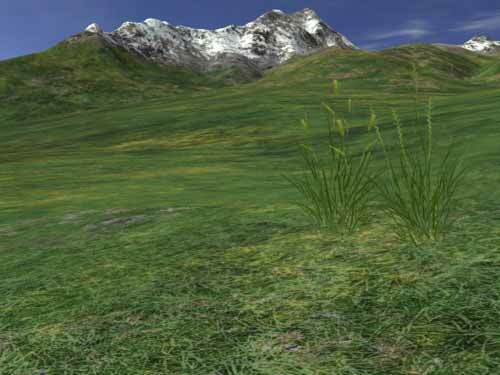 Picture1 was rendered with 9 terrain layers mentioned above. The mountain scene already looks decent but if you desire to have enough detail for close-up views and also add more realistic colors to the terrain overall, real-life photo textures may be used for the color map. Mixing RGB color and photo textures through the GroundWiz layer setup will also add a lot more variation. Picture2 was rendered with layers mixing RGB color and photo textures.